There are 6 key instructional shifts that are at the center of Ohio's Learning Standards for literacy and math. Do you know them? Could you identify them if you saw them in action in classrooms? What do students sound like, write like, reason like if they are learning standards through these shifts? As you read through my reflection on this shift, think about your own classroom, building or district. What does this shift look like and sound like? What actionable step might you take that might have a direct impact on student learning? How will you share what you have done with your colleagues? Literacy Shift 1 : Regular Practice With Complex Text And Its Academic Language. What is the academic & content vocabulary demand of the text? What is the language demand? What prior knowledge of content or culture does the text demand? How is the text to be used by the reader? What is the purpose for reading/listening to the text? There are a number of tools that can help you to look at the Quantitative Measure of the texts you are using in your classroom. Teachers who are mindful of vocabulary demand will Close Read texts prior to assigning them to students to look for words that may need to be pre-taught, words that may be used uniquely in the context, or words that are keys to a student's ability to unlock the content of the text. Students might use Frayor Models to help construct meaning for key words. Interactive word walls in the classroom may contain examples of words being used in context, and images that illustrate meaning or usage. Academic Word Finder - Achievethecore.org This tool can be used as part of the Close Reading process the teacher utilizes prior to assigning passages to a student. Look for passages that have a balance of words at, below and above grade level. Passages with many words above or below grade level may still be appropriate to use with students depending on the purpose for reading the passage and the Qualitative Features of the text. Cut and paste text or type text into the Word Finder. The Word Finder tool will highlight in colors words that are below, at, and above grade level within the text passage. Listed below the passage will be possible definitions of the word. The complete passage is visible with words highlighted in context. Lexile Analyzer - Lexile.com Lexile is one way to look at the Quantitative Measure of a text. Approximate Lexile ranges for each grade level have been included in the literacy standards. Lexile can be compared to other quantitative measures like AR scores. You can cut and paste text into the Lexile Analyzer, but it needs to have all formatting removed. WordSift.org WordSift looks more closely at academic vocabulary and content vocabulary. A word cloud will be created, showing the highest frequency words. This is a good way to identify words that may be key to unlocking the content of the text. The word lists tool will highlight in colors words that are specific to science, math, social studies and ELA. A set of related images will appear for each word that is clicked on in the word cloud. You can use these images to add to your word wall or make visual dictionaries for ELL students or at risk readers. Qualitative features of a text can be looked at using a rubric or a checklist. There are 4 areas to consider. First, is the text structure simple or more complicated? Remember that text can also be a graphic, so look at the graphic features as well. Are there text structures that are normally found in a particular content area writing style or in a genre? When skimming the text on a first Close Reading, is the language more conversational or formal? Are terms contemporary or more unfamiliar? Teachers being mindful of the Qualitative features of the text will also take into consideration the knowledge that a text expects a reader to bring with them into the reading. This can be cultural or regional experiences, content specific background or individual life experiences. This particular aspect of text complexity requires the teacher to think carefully about how to scaffold texts for students who may be lacking some or all of the background knowledge a more complex text might require. Ideally, the text is the expert and students will not need to bring large amounts of prior knowledge into their reading and discussion of the text. 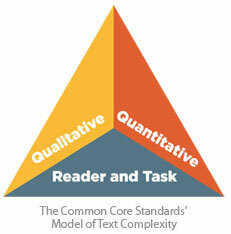 Matching reader to task is often overlooked as the third component of complexity. A text may be moderately or slightly complex, but be a primary source document that is important to helping a student understand the context of an historical event. On the other hand, a text that is exceedingly complex may be a scientific paper a student is reading to get background information for a project. All children should be given the opportunity to read a range of complex texts throughout the year. Texts should be high quality, be worth the instructional time to read them, and help students to build knowledge and vocabulary. One strategy a teacher might consider when selecting informational and literary texts to use in a classroom would be to build expert text sets. Students build content vocabulary and knowledge when they have an opportunity to read, listen too, or analyze multiple texts on the same topics.